I’ve thought about this little blog a lot lately. I do miss it but have gotten easily distracted by other things, and I’m not sure if anyone’s even looking at it anymore as a result of my bad posting habits. We moved into a new home in a new city with a new job into a brand new home so we’ve done a lot of decorating, had our basement finished, explored, traveled, etc. I tried a couple times and sadly both the WordPress software and Picasa picture sharing software changed, and I still need to go back and figure things out…anyone know how to make the image link work? It used to have a link that I could image share through but now WordPress doesn’t recognize that link as acceptable… Hopefully once I figure that out, it’ll be back to semi-regular posting. Anyways! Corrie’s family has a fun Breakfast at Wimbledon tradition where they partake in strawberries and cream while watching the men’s final. This year, my mother-in-law came to visit us for it! We had strawberries and cream as well as some strawberry pancakes which I don’t think I had honestly ever had before, but I do think will become another yummy pancake recipe in our rotation. Blend washed, hulled strawberries in a food processor until pureed. Set aside. Mix together flour, baking powder, sugar, and salt in a bowl. In a separate bowl, lightly beat the eggs. To the eggs, about 1 cup of the milk, strawberry puree, and then the melted butter. Mix well. Add the wet ingredients to the flour mixture and whisk together to get all the lumps out. If the batter is still dry or lumpy, add more milk until the batter is wet and smooth. Heat a griddle or skillet over medium heat, grease with butter or cooking spray. Pour out 1/4 cup of batter for each pancake. Once air bubbles have formed on top, flip and cook until done on the remaining side. Recipe found at Heather Drive Source: Adapted from Cin Cin, Let’s Eat! I also love that you could do so many variations. It seems like a vanilla greek yogurt would be yummy as would a variety of fruit or craisin combinations. You could use slightly less milk if you wanted a drier oatmeal, etc. Possibilities are endless! Preheat oven to 375°. Grease a 1 and 1/2 quart casserole with butter or cooking spray. In a medium bowl, mix together the dry ingredients: oats, pecans, coconut, baking powder, cinnamon, and salt. In a small bowl, whisk the wet ingredients together including: maple syrup, milk, egg, butter, greek yogurt, and vanilla. Place an even layer of the sliced bananas at the bottom of the casserole dish. Top the bananas with 2/3 of the berries. Evenly spread the oat mixture over the fruit, and pour the wet mixture over the oat mixture, distributing as evenly as possible. Top with remaining berries. Bake the oatmeal for 35-45 minutes. Remove from oven and serve. The one benefit of not having posted regularly is that I have developed a nice little library of recipes we’ve tried and not yet posted. 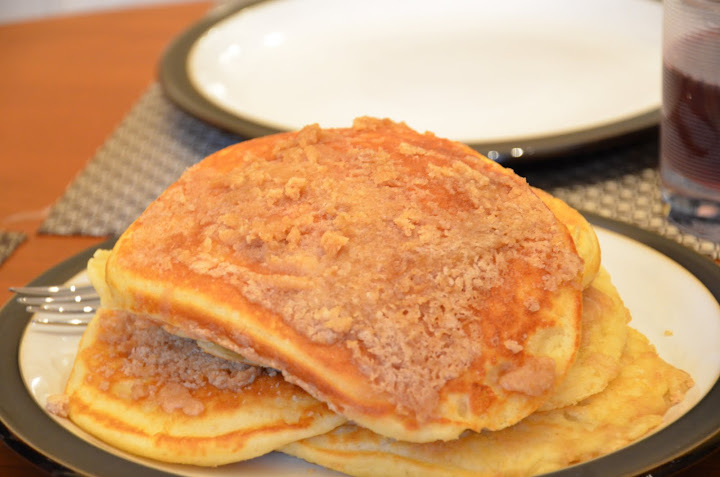 In fact, I made these cinnamon streusel pancakes when my brother visited us in our old house back in March. Yowzers. Although, if you think that’s bad, I still need to post a completely delicious German Chocolate Cake from my dad’s birthday 1 1/2 years ago. HA. Cinnamon Streusel: In a medium bowl, combine flour, brown sugar, cinnamon, and butter. Mix together with your hands or a fork, until you have a crumbly mixture. Set aside. Making my own granola sounded intriguing, so I decided to try this one. It was perfect as a mix-in to some yogurt! I think the best thing about making granola is that it’s more difficult to make incorrectly. I decided a few weeks later to try some bars and ended up winging it based off a few recipes, and it turned out great…unfortunately so great that we ate it all before I remembered to take pictures of it! Combine the rolled oats and puffed rice cereal in a large bowl,. In a separate medium-sized bowl, whisk together the honey, applesauce, mashed banana, peanut butter, salt, cinnamon and brown sugar until smooth. Pour the wet ingredients into the dry ingredients and stir with a rubber spatula until the oat mixture is evenly coated. Spread onto the prepared baking sheet in a thick, even layer. Bake for 30 minutes. 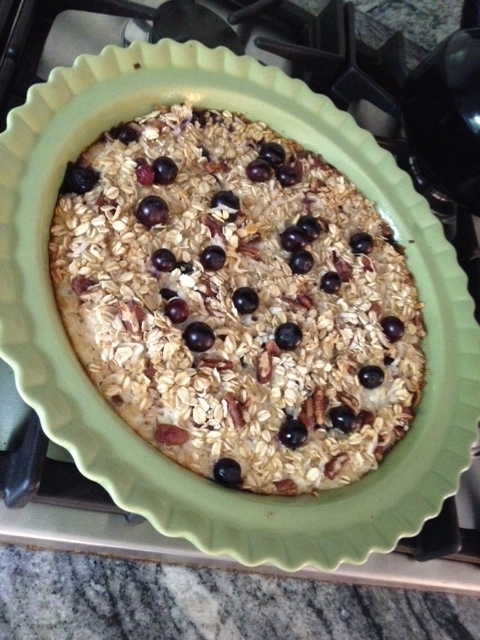 Remove from the oven, and using a large spatula, turn the granola over in segments. Bake for an additional 15 minutes. Depending on the size of your baking sheet, the center may not be fully dried. If necessary, remove the edges of cooked granola and bake the remaining granola for 10-15 minutes more or until done, being careful not to over-bake. Cool on a wire rack. Once the granola has cooled, crumble it into a large bowl or plastic bag. Add in the dried banana chips, honey roasted peanuts and bittersweet chocolate, if using. Mix well to combine. Store in an airtight container. For Mother’s Day, I made brunch; however, I did make one mistake with this recipe. I wasn’t really thinking about it, and I used the wrong kind of baking dish. As a result, I didn’t achieve “crispy” bread like I would have preferred. However, changes in hand next time – using a baking dish with more surface area like a 9″ x 13″ Pyrex-type dish – I would make this again. Melt the butter in a medium skillet over medium heat. Next add in the onions and sauté until soft, about 5 minutes. Add ½ teaspoon of the salt, ¼ teaspoon of the pepper, and the nutmeg (if using), and allow to cook for another minute. Stir in the spinach, remove from the heat and set aside. Butter the inside of a 2½-3 quart baking dish (use a shallower and longer baking dish than I did). Layer the bottom of the dish with one third of the bread cubes. Top with one third of the spinach mixture and one third of each of the cheeses. Repeat these layers twice more with the bread, spinach and cheese. In a medium bowl, combine eggs, milk, remaining ½ teaspoon salt and ¼ teaspoon pepper. Whisk until blended. Pour the mixture evenly over the bread and spinach layered in the baking dish. Cover with plastic wrap and chill for at least 8 hours or up to 1 day. Combine the egg and buttermilk in a liquid measuring cup. Whisk flour, oats, sugar, baking powder, baking soda, salt, and nutmeg in a large mixing bowl. Add the butter to the bowl and toss. Cut the butter into the flour mixture with a pastry blender or fork until the mixture so that the mixture is crumbly. Pour the egg and buttermilk mixture into the dry ingredients and mix with a fork just until incorporated. The mixture will be sticky. Fold in the berries gently only until incorporated. Gently knead the dough 6-10 times, just until it comes together into a sticky dough. Portion the dough out into 8-12 scones, depending on the size you prefer, and transfer to the prepared baking sheet. I love cheddar, and dill is probably my favorite herb, so needless to say once I saw these I was immediately intrigued. Eventually I ended up with 1/2 a package of remaining dill, and I thought YUM! My only change was that, as you can see, the cheddar tends to “weep” while melting. I think next time I’d like to try using freshly shredded cheddar and see how that works! Combine 2 cups of flour, baking powder, and salt in the bowl of an electric mixer fitted with the paddle attachment. Add the butter and mix on low speed until the butter is in pea-sized pieces. Whisk together the eggs and heavy cream and quickly add them to the flour-and-butter mixture. Combine until just blended. Toss together the cheddar, dill, and 2 teaspoons flour and add them to the dough. Mix until they are almost incorporated. Transfer the dough to a floured work surface and knead for 1 minute, until the cheddar and dill are well distributed. Roll the dough into a 3/4-inch thick, 8-inch square. Divide into 4-inch squares and then cut those in half diagonally to make triangles. Transfer the dough triangles to the prepared baking sheet. Brush the tops with egg wash. Bake in the preheated oven for 20-25 minutes, until golden and the inside is fully baked. I’ve made this quiche more than most menu items. It’s delicious, vegetarian (always handy when my awesome brother is around), and other than prepping some ingredients very simple to put together. I used to rarely eat quiche growing up, because it always seemed to contain mushrooms; so, this is a big winner for me! Fit the pie crust into a 9″ (deep-dish) tart pan; prick the bottom and sides of the crust with a fork. Bake at 425 degrees for 10 minutes, then remove and set aside. Saute bell pepper, onion, and garlic in hot olive oil for 5 minutes or until tender. Then stir in the basil. Whisk together eggs, half and half, salt, and pepper in a large bowl, and once combined, stir in the sauteed vegetables and cheeses. Pour the mixture into the piecrust and top with the tomato slices. Bake at 375 degrees for 40 to 45 minutes or until set. The recipe says you can shield the edges with aluminum foil after 30 minutes to avoid excessive browing, but I’ve never had this problem. Let stand 5 minutes before serving otherwise it will fall apart too much when you cut into it. 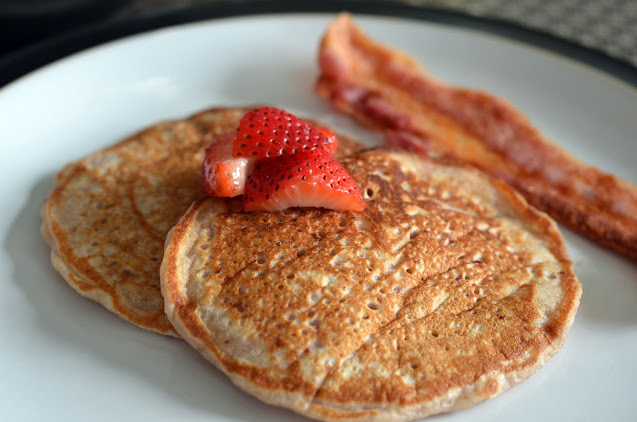 These pancakes were a wonderful and delicious way to use up some ripe bananas instead of the traditional banana bread. Next time I may even try them with macadamia nuts or even a little coconut. Combine the dry ingredients – flour, sugar, baking powder, and salt in a bowl. In a different bowl (one large enough to have the flour mixed into it), mix together egg, milk, oil, bananas, and vanilla. Add the flour mixture into banana mixture, and stir until just combined. The batter will be slightly lumpy. Heat a lightly oiled griddle or frying pan over medium to medium-high heat. Pour or scoop the batter onto the griddle, using approximately 1/3 cup for each pancake. Cook until pancakes are golden brown on both sides, and serve while warm.